Taft had a difficult term as president because he could not fulfill Roosevelt’s dream of progressive reform. 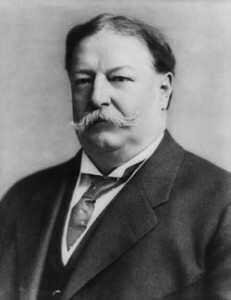 Some have said that Taft was ill-suited for the hard work of the presidency. As a boy he had loved dancing, and this affable man was more inclined toward a life of fun and ease rather than intense labor and conflict. He loved to play golf, and was most famous of all, for his large size. Although many antitrust cases were settled during his Presidency, and the income tax was established, Taft ran into conflict over several issues. Conservation issues became especially heated after Taft fired Gifford Pinchot, the symbol of Roosevelt’s conservation policies. Taft was conservative by nature, and ended up supporting capital over labor time and again, and feared the progressives wanted to overturn the social order. Eventually Roosevelt challenged Taft for the nomination of the Republican Party, and ended up creating the Bull Moose Party. In the 1912 election Taft finished third. When he was president he appointed Unitarian president Samuel Atkins Eliot to the U.S. Board of Indian Commissioners. After his term as U. S. president, Taft became president of the General Conference of Unitarian and other Christian Churches from 1915-1925, at which time the General Conference was absorbed by the American Unitarian Association (AUA). In 1917 he was drawn into controversy over World War I. In his capacity as moderator of the proceedings, Taft gave an opening address. He called upon the Conference to affirm President Woodrow Wilson’s conduct of the war, only to be followed by John Haynes Holmes’ speech criticizing the war effort. In the fiery debate that followed, Taft called for and received a positive vote on a resolution to continue the campaigns and win the war. There was concern that some ministers were creating discord in their parishes, and Taft affirmed this with his own role at his home church in helping to oust the pacifist minister. Taft was appointed chief justice in 1921 by President Warren G. Harding. When he became ill in 1930 he had to resign, and then died on March 8, 1930.